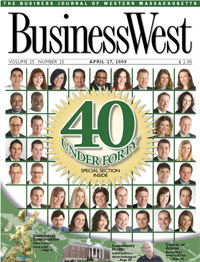 Back in 2007, when BusinessWests inaugural 40 Under Forty honorees gathered for a group photograph outdoors, the sky was clear and bright  appropriate, since the clouds that now darken the nations economic outlook were a long way off. It was an impressive group of entrepreneurs, innovators, and community leaders  in short, success stories that any region would be proud to tout. Last years group of honorees  in the second go-round of our annual celebration of the regions young talent  was equally impressive, even if the economy was growing shakier by the week. This year, economic bad news is everywhere, and the clouds only seem to get darker by the day. But guess what? Our third 40 Under Forty class shines just as brightly as the first two. and, in most cases, staying intimately involved in their communities through service on boards and volunteer efforts with charitable organizations. Better yet, theyre creating lasting legacies that will inspire others to follow in their footsteps. Check out Kathy LeMay, this years highest-scoring honoree, who is cultivating philanthropic connections that will make a difference throughout the region for years to come. Brenda Wishart has worn a number of hats over the past decade, all aimed at building the next generation of entrepreneurs. Corey Murphy takes time away from his insurance agency to help kids read and do well in school  maybe giving a leg up to a future 40 Under Forty winner along the way. By most expert accounts, the clouds will clear. And when they do, what will be left standing are the 40 Under Forty and others like them, who are working hard to build a buzz  and a foundation for long-term economic health  in the Pioneer Valley and beyond. And now, wed like to tell their stories, so you can be inspired, too.